Loose yourself in the melody, and experience another world. The rich songs that colored every scene of the BL game "Lamento -BEYOND THE VOID-" have finally been released as a CD soundtrack! And the name of that soundtrack is "Lamento O.S.T. -The World Devoid Of Emotion-!!" All music has been composed by the musical collective "ZIZZ." 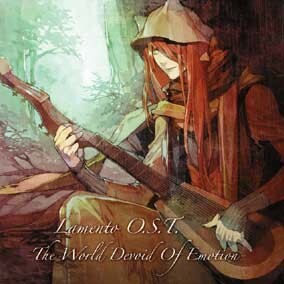 Following the "Lamento -BEYOND THE VOID-" concept of "enchant with music," it includes 32 musical masterpiece BGM tracks, opening theme sung by "Ito Kanako" and "Watanabe Kazuhiro," and 5 vocal tracks including the ending theme. Also among the tracks is "Tataeshi Tatakai no Uta," which utilizes background music used in the game, but re-recorded with all new vocals for a rendition that you'll only find on the original soundtrack!